We returned to Oz at the end of January, having spent four months back in the UK, welcoming our second grandson Alex to the world and more prosaically, spending over a month working hard to reverse the ravages that eight years away had visited on our New Forest home. It was a fabulous visit which spanned the Festive Season, our older grandson, Sean's 3rd birthday and afforded enough time to see far more friends than we normally manage. After only three days back on Amoenitas, near Brisbane, we were off again touring by car in what turned out to be a 9000km trip encompassing New South Wales, Victoria, South Australia and Tasmania. The scale of this country is such that we covered 860km on our first day out! We had gone south before using the the East Coast Road and the New England Highway but as Melbourne was the initial destination, we decided to take the more inland, Newell Highway. This gave us an insight into the toll the six year drought has wrought on the agricultural sector. For nearly a thousand km the land is almost totally brown and with most stock sold off, the few remaining have consumed even the roots of the grass, leading often to soil wind erosion. 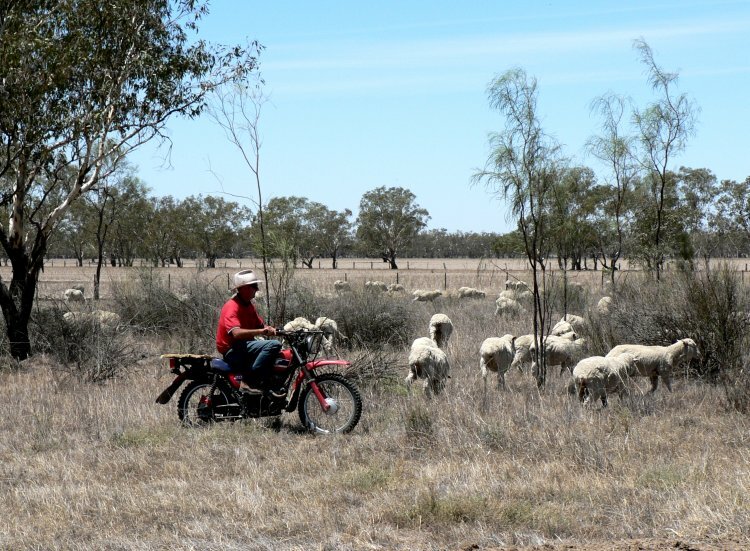 Farmers have resorted to grazing their cattle and sheep on the roadside verges, known here as 'The Long Paddock'. Central NSW is a home to a number of both optical and radio astronomical research facilities and Dave can never resist a decent sized paraboloid. 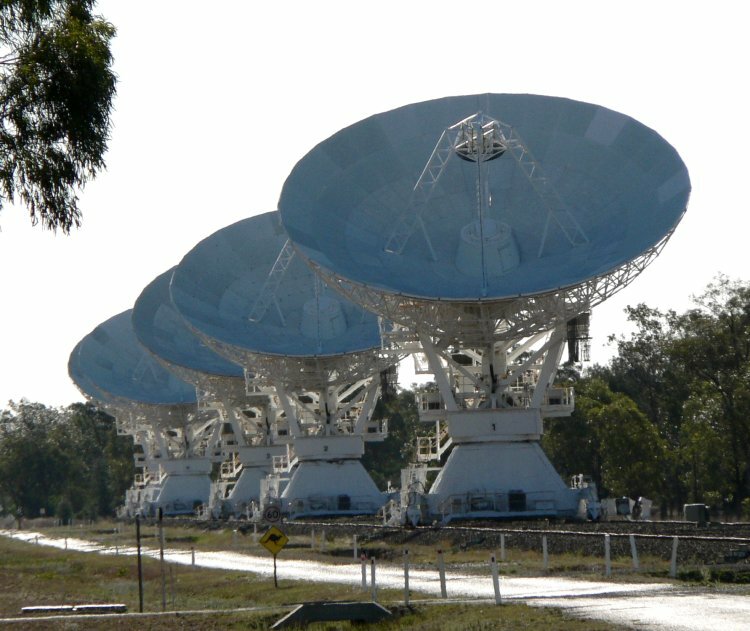 At the Paul Wild Observatory near Narrabri is the Compact Array of five, 22m dishes which can be deployed on a 3km rail track, with a sixth dish 3km away. This gives a 6km synthetic aperture which is employed to study galaxies, supernovae, quasars, black holes, interstellar gas clouds, as well as individual stars. Just a day away is the Parkes radio telescope, a single 64m reflector which we also managed to visit. Melbourne, the southern of the two big, competing Oz centres of population is a lovely place. Like Sydney it is resplendent with fine buildings constructed from sandstone, often enhanced with attractive, naturally occurring patterns. 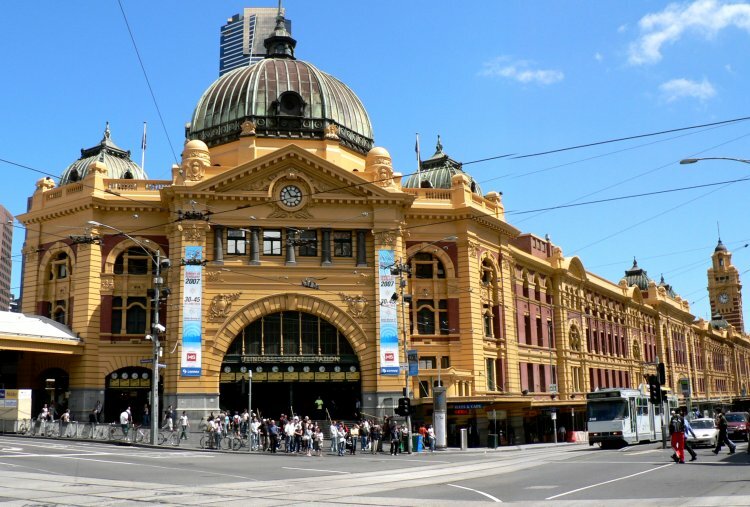 Most significantly it has kept its inner city tram network which makes getting around both fascinating and convenient. Many of these trams are colourfully adorned, sadly the only one in the picture is battleship grey. It is unusual to get this view with only one tram in view, perhaps we were trying to get a clearer view of the station. The city is a great patron of all the arts so we had to partake of a concert by the Melbourne Symphony Orchestra. In contrast we also took in a show, Barry Humphries (Dame Edna Everage) in 'Back with a Vengeance', a celebration of the 50th anniversary of his taking to the boards in his home town. His act is very different with the home crowd from what we have been accustomed to over the years in the UK. Multiple references to the Queen are replaced by much more salacious fare with the inevitable denigration of 'Johnny & George'. It made for a great evening of peculiarly antipodean humour. 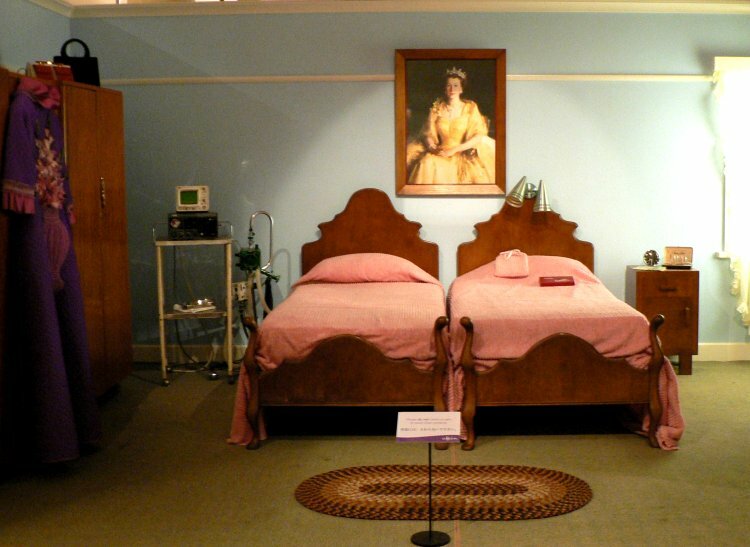 Accompanying the show at the State Theatre Arts Centre was an Ednaville exhibition featuring most of the rooms of the 50's home which is the backcloth to most of the Dame's character. 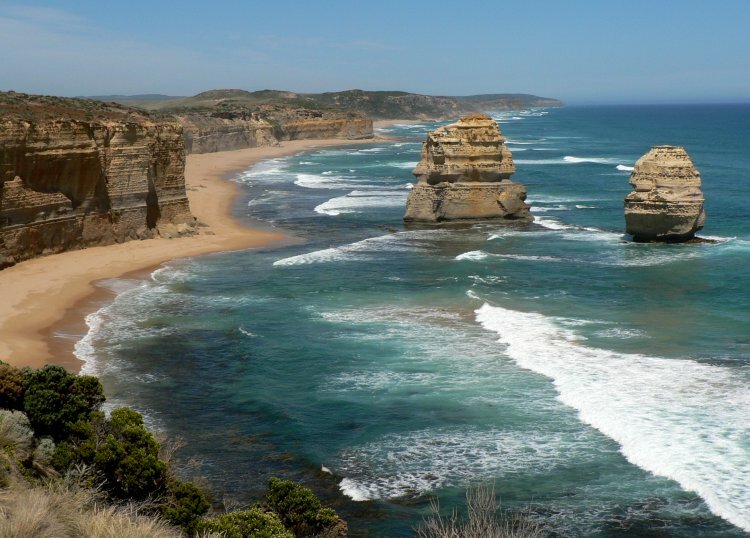 The Great Ocean Road begins just to the west of Melbourne, continuing to delight the eye with the most magnificent of coastal views for over 200km. A long stretch has sandstone cliffs which in the continual process of erosion have formed many impressive structures. The ones below are just a km from the better known eleven apostles but were better lit when we arrived later in the day. There are also several arches with one called London Bridge which until recently had two spans. The inner one collapsed one day when a couple of visitors were fortunately at the far end. They were lifted off by helicopter but as the story goes, were less than enamored with the publicity they received as their relationship was allegedly illicit. To the north west of Portland at the far end of the Coast Road on the Glenelg river is a most interesting National Park named after Princes Margaret Rose. It was her loss that she never visited the park she gave her name to. 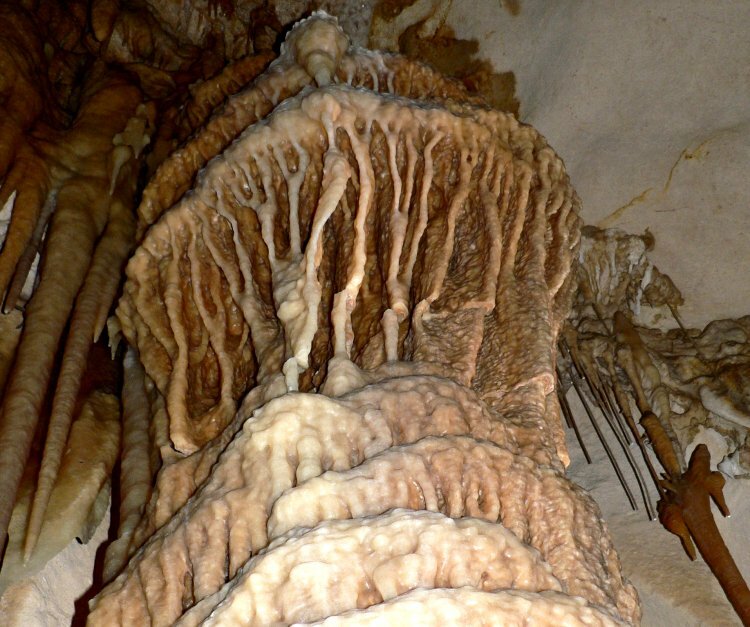 There is a most wonderful cave there with the most incredible calcified formations that we have seen anywhere in the world. 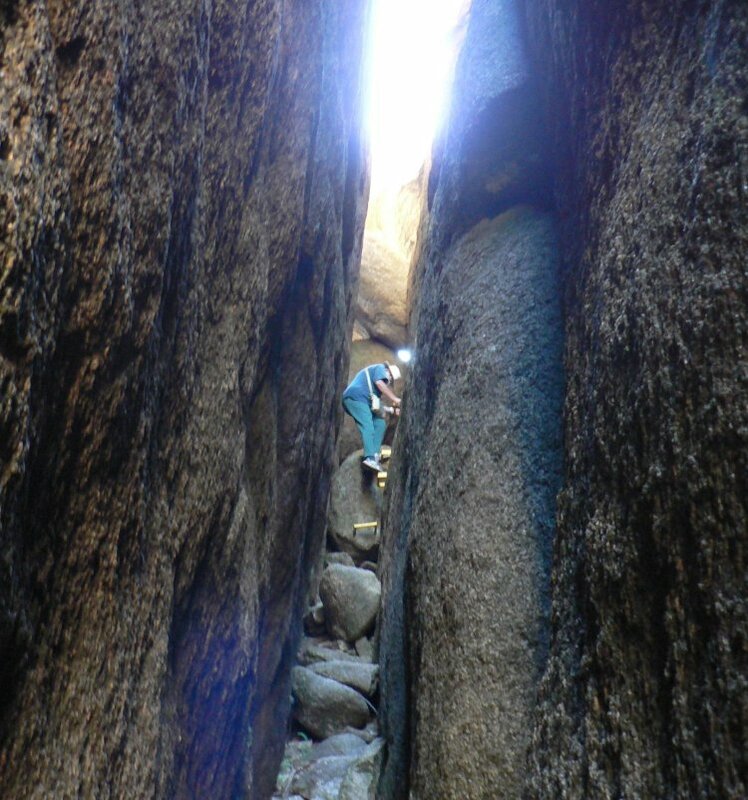 Especially interesting are the helioliths which defy gravity by forming upwards from the sides of stalactites. This apparently is a rare phenomena, thought to result from the effects of surface tension, enhanced by circulating air currents. We camped at the site just beside the caves which turned out to be one of the best set up rustic sites we have encountered anywhere. Spacious but well isolated plots were scattered through the forest, each with its own table, benches and hearths. 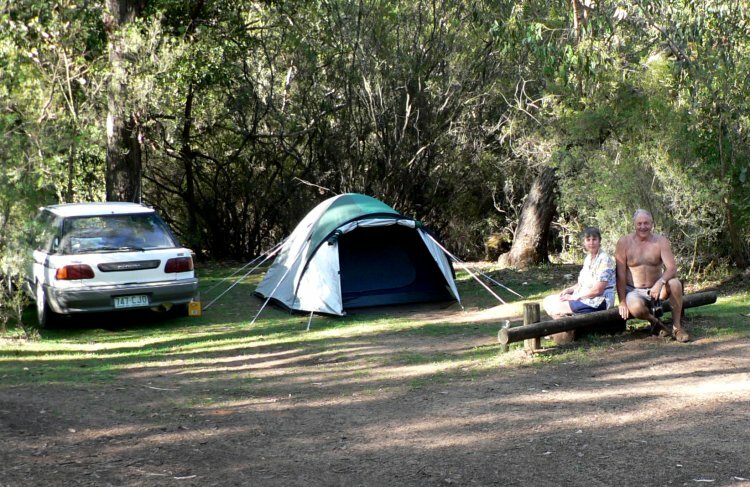 The tent is one we acquired in New Zealand and have used for the last five years in what must amount to over 25,000km of touring. The hearths were large circular concrete structures which afforded good containment and low risk of stray embers igniting the surrounding brush. This is essential in a such a dry country with the ever present risk of bush fires. 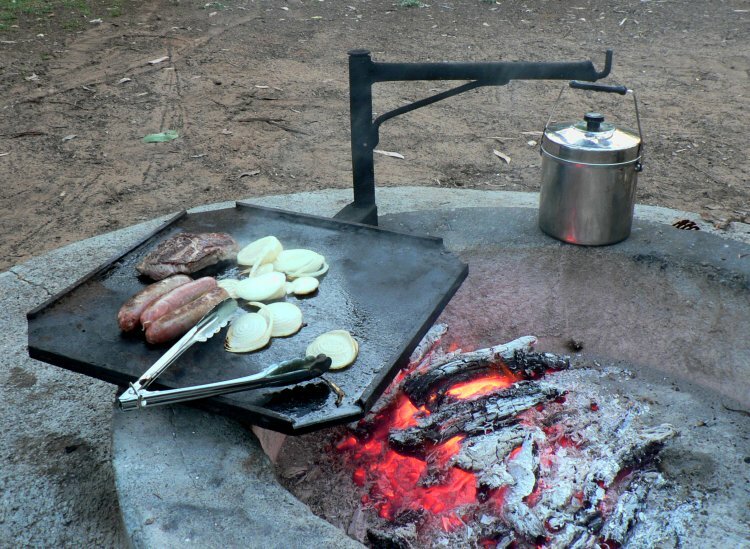 Here you can see dinner being prepared but the fire really comes into its own after dusk when we get to bask in the warm light to contemplate the happenings of the day. From our camp above it was but a stones throw (almost literally) to the South Australian border. Delaying only for a morning which we used to explore the nearby Glenelg river in a hired tinny (aluminium boat), we sallied forth into our 5th State of the Federation. It takes a little getting used to how different things can be between neighbouring Aussie states. As we entered SA we had to factor in a half hour time difference. This not as bad as the fact that Queensland does not follow the 1hr daylight saving time policy adopted by NSW, and Victoria immediately south of them. Life must get confusing in towns like Tweed Heads that straddle the border. We found SA drier and generally a little quieter than Victoria, particularly in the towns in the evenings. However there were some very good wine growing areas such a Cunawarra to explore and this spectacularly coloured crater lake at Mount Gambier. Eventually it was time to head east again to pick up the ferry for Tasmania in Melbourne. On the way we came across the Grampians, yet another highland singularity in what for the most part is a very flat continent. 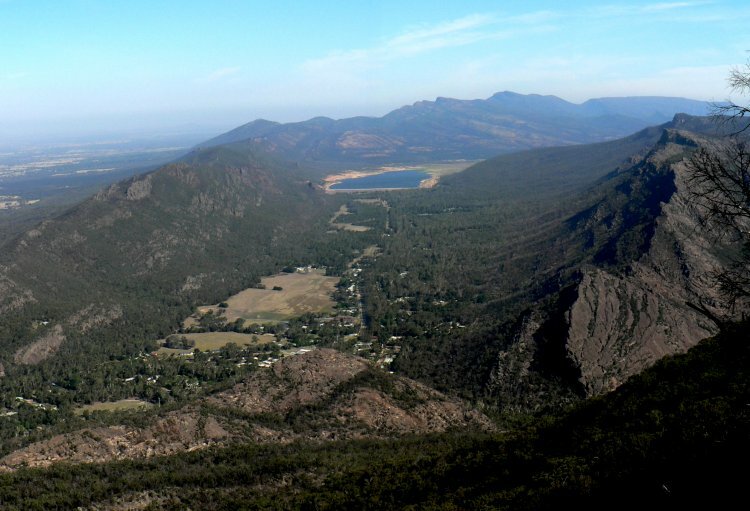 Below is the view of the sprawling little town of Halls Gap, viewed on an evening stroll at the Boroka Lookout. The area is yet another well organised National Park with well documented and developed tracks to all the major features. For us, the most outstanding memory will be of a formation called The Balcony which we had seen in publicity but not in any of the walk descriptions. The rangers in the NP office said it was 'not accessible'. When we spotted it, some way off from a constructed viewpoint; it was too much to resist getting to and out onto. The view is stupendous from what looks like a robust rock diving board suspended maybe 150m (500') above a sheer drop to the valley below. If you go there, ensure there are no safety officers in your party! 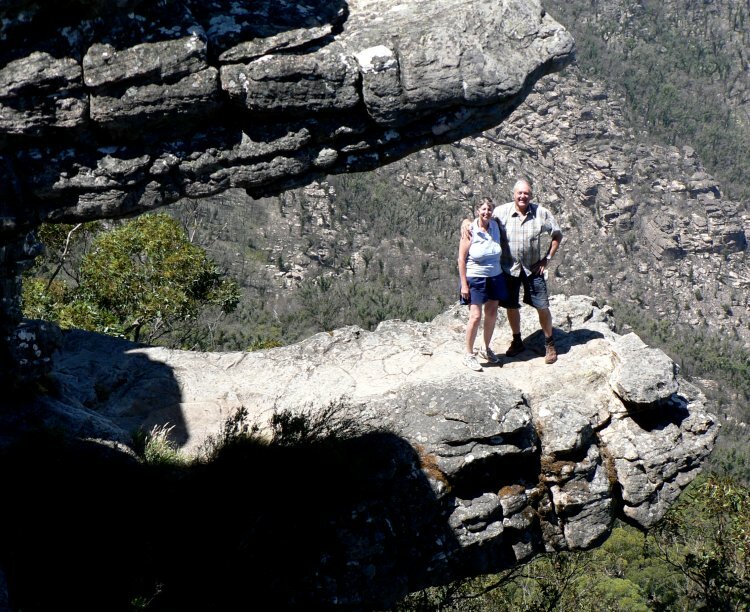 Those in search of further walks with a touch of additional adrenaline might consider another National Park at Mount Buffalo on the Great Alpine Road to the northeast of Melbourne. There are huge obelisks there, perched vertically on top of cliffs to test your head for heights as well as a claustrophobia inducing climb down a steep face within a crack not much wider than your shoulders. Here Di is negotiating three steps that some kind ranger has fitted about half way down the 200m climb. 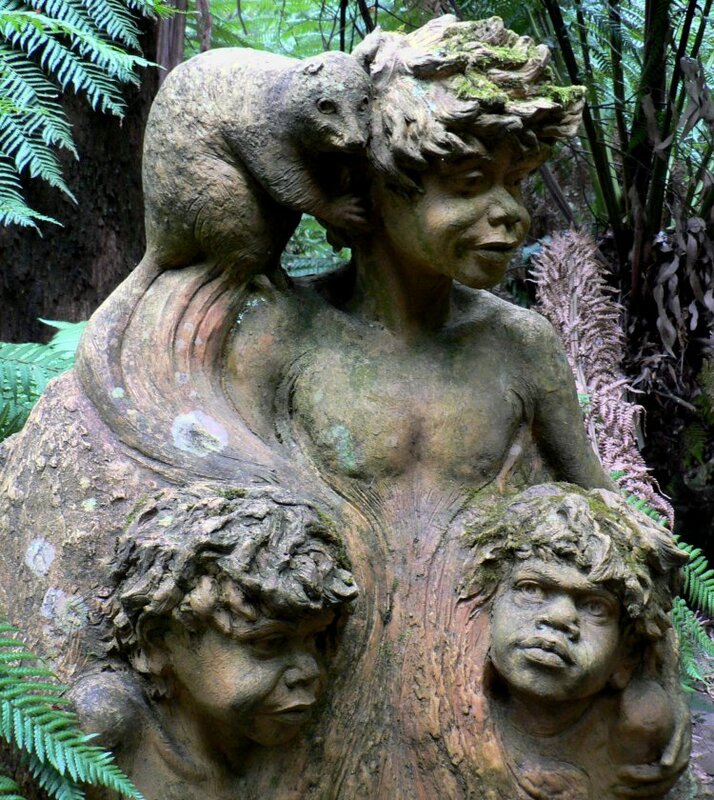 In the hills behind Melbourne we came upon this unusual collection of statues, the life work of one William Ricketts. His work at Mt Dandenong from 1934 until 1993 was dedicated to expressing his concern for care of the environment and was inspired by his contacts with desert people of the Pitjantjara and Arrernte. The result is 92 ceramic sculptures of people and animals which merge with the natural surroundings. 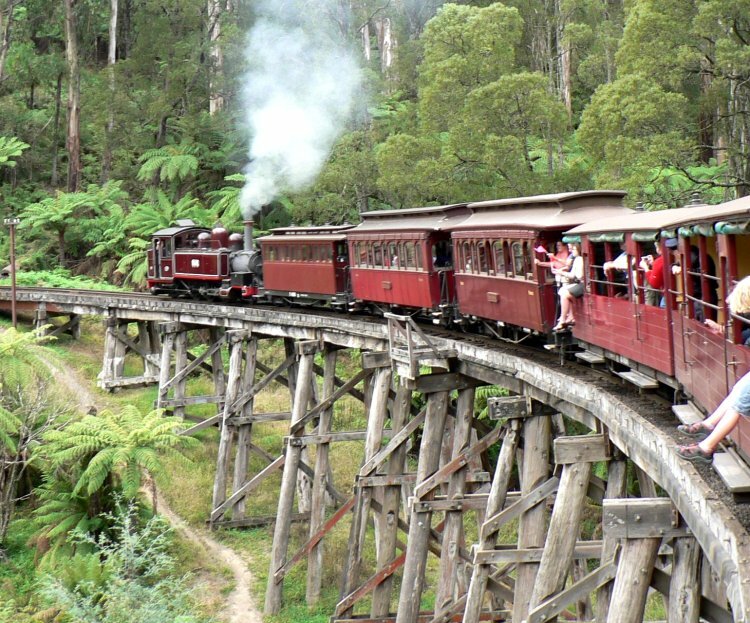 Just a few km from the Dandenong Ranges, around 45km east of Melbourne was an active railway preservation group operating under the title of Puffing Billy (www.puffingbilly.com.au). Knowing that Sean, our older grandson is besotted with Thomas the Tank Engine and the age of steam, we thought we ought to check it out for him. It proved a magic experience amongst dedicated volunteers (mainly retired ex-POMs) which left us feeling very sad that we couldn't have enjoyed the experience with Sean beside us. Still, we took lots of pictures and video to send to him. At last we get to Tasmania, the title of this update which was the ultimate objective of our tour. The crossing of Bass Strait has conjured many emotions since the disastrous Sydney to Hobart yacht race of around 10 years ago. Our outward passage lived up to that reputation with 40-45kt SE headwinds. That generated 60+kts of wind across the decks, confining all below decks, many fondling brown paper bags. On the other side at Devonport, friends John & Jan from Romsey were there to greet us. 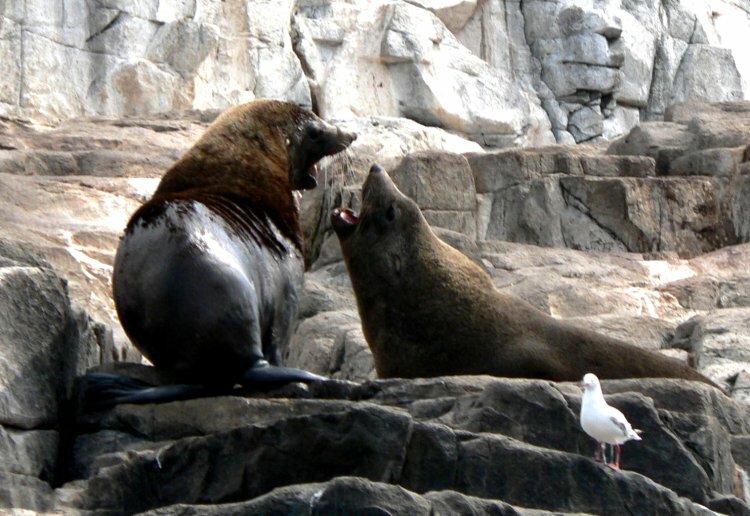 They had planned their visit downunder to share a week in Tassie. Together with them in a campervan we began a clockwise tour of this beautiful isle. 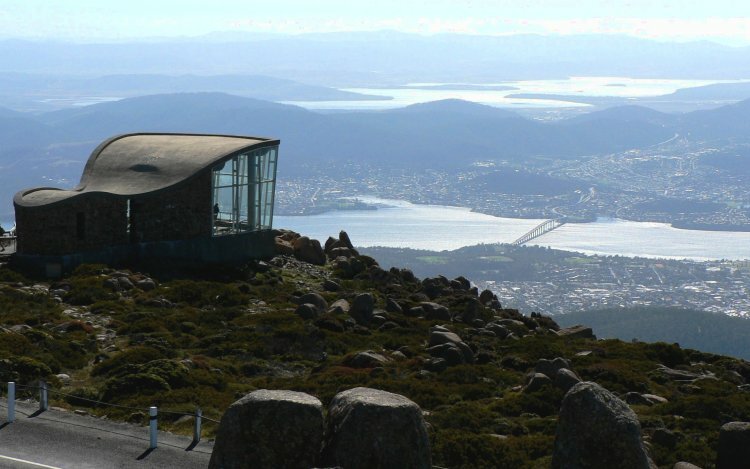 At the capital, Hobart we were entranced by the views from Mount Wellington which rises to 1500m right behind the city. Our stay there was very pleasant with a chance to have lunch with sailing friends Brian & Clare whose boat was anchored by the yacht club. We even timed it well enough to enjoy pottering around the famous, weekly Salamanca street market. Not far away is Port Arthur which evokes memories of the revolutionary deportation of convicts, often for the most menial of crimes. 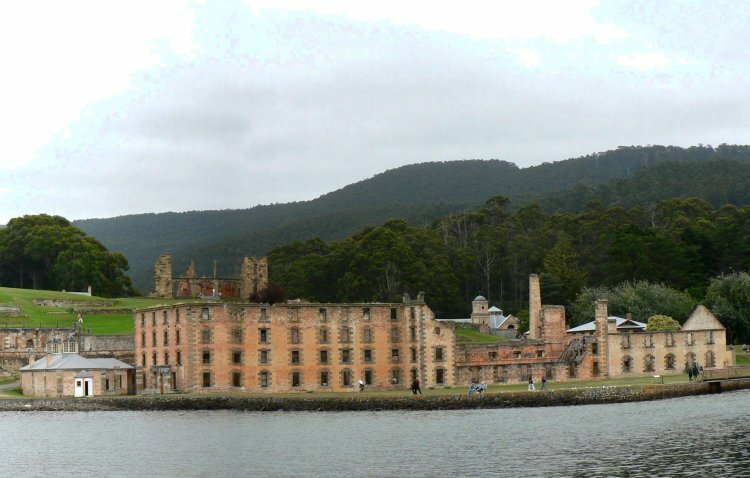 The first inmates arrived in September 1830 to a bare site chosen for the ease of access to Hobart by sea. The isthmus location was also favoured because the narrow strip of land joining it to the main island at Eaglehawk Neck was easily controlled. A line of dogs were tethered along the 200m or so wide neck of land, with further dogs moored offshore on floating pontoons. That along with tales of shark infested waters was enough to deter any escapees. Having read historical novels which embodied the experiences of inmates we were prepared for tales of man's inhumanity to fellow man. However, it would appear that it was not quite like that. Firstly, the site housed only the difficult cases of deportees that repeatedly re-offended in the colony. Also, there were serious attempts to reform, educate and train felons for rehabilitation into colonial society, along with some ground breaking work with the Empire's first dedicated prison for boys at Point Puer (1834-49). Transportation to Van Diemens Land ended in 1853 when the colony specialised in welfare activities until it was closed in 1877. Now the site is a monument to an ambitious but deeply flawed experiment. 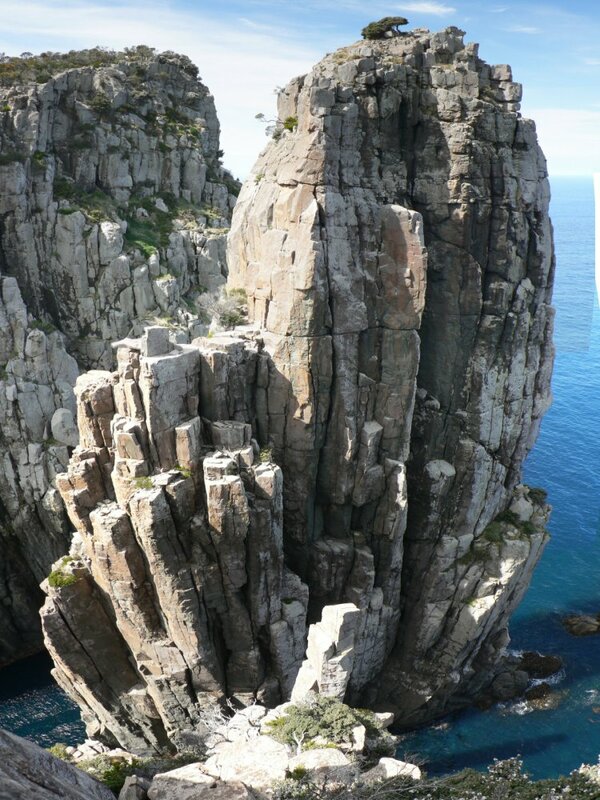 Much of the shoreline of SE Tassie is formed by sometimes high cliffs of dolerite, an igneous rock created from molten lava when Gondwana split apart 165 million years ago. It often appears as towering crags of crystal like formations. Off Bruny Island on the far south coast where the Tasman Sea meets the Southern Ocean are spectacular examples. 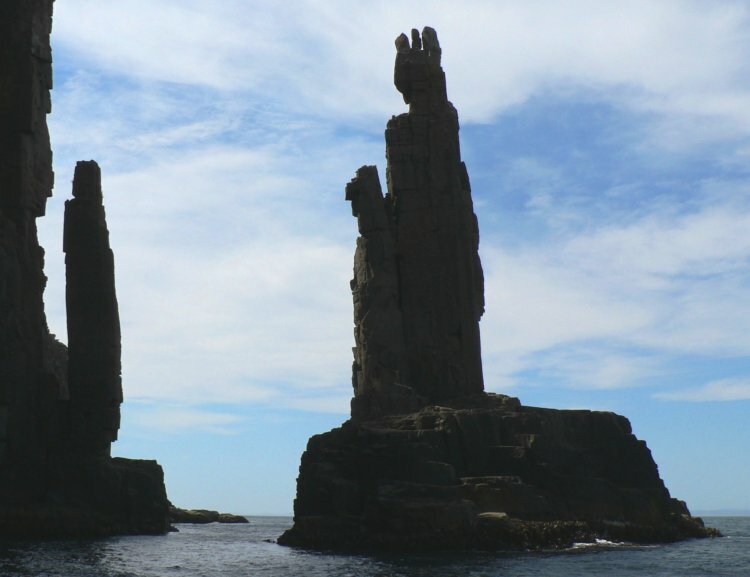 This one called The Monument was the focal point of a 50km, 40kt boat trip speeding through the 10m gap inside this towering rock, as well as into several caves. This was also an area rich in seafaring history, as our voyage began at Adventure Bay which was visited by Abel Tasman (1642), Furneaux (1773), James Cook (1777), William Bligh (1788 & 1792), De'Entrecasteaux (1792 & 1793), Matthew Flinders (1798), Baudin (1802), etc. Further round to the northeast we had camped in the charming Fortesque Bay where we could imagine Amoenitas at anchor (good conditions only!). From the bay it was a four hour return walk to Cape Huay, famed again for seascape vistas and spectacular rock sculptures. Thinking I would be able make it all the way to the end of the peninsula (LHS of picture), imagine what a shock it was to be confronted with a chasm from sea to cliff top dividing the landmass. Lying precariously on my stomach, extended out over an overhanging rock I got this picture, a stitch of four horizontal images (amazingly not a sign of any camera shake!). 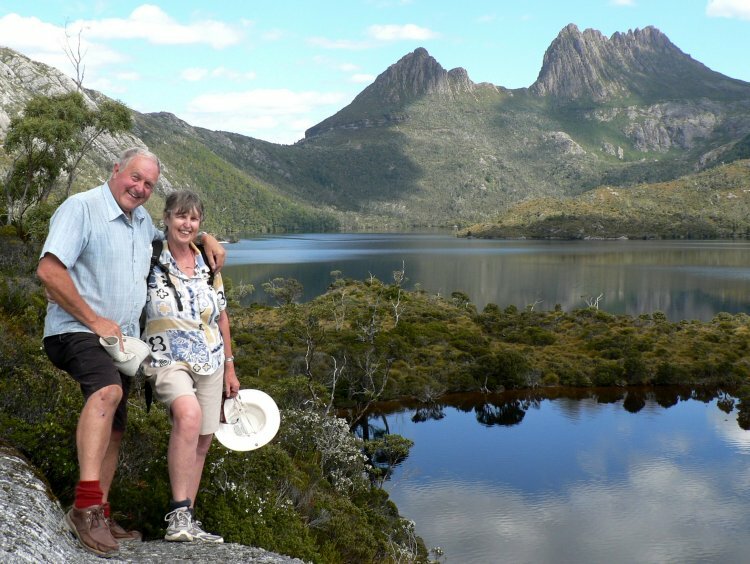 Having completed our clockwise tour of Tassie, we had just one main attraction to cover, the Cradle Mountain National Park. In good weather this is a glorious area to walk and climb with well marked tracks and magnificent views. We were there for three intensive days, beginning with the two hour walk around Dove Lake below. 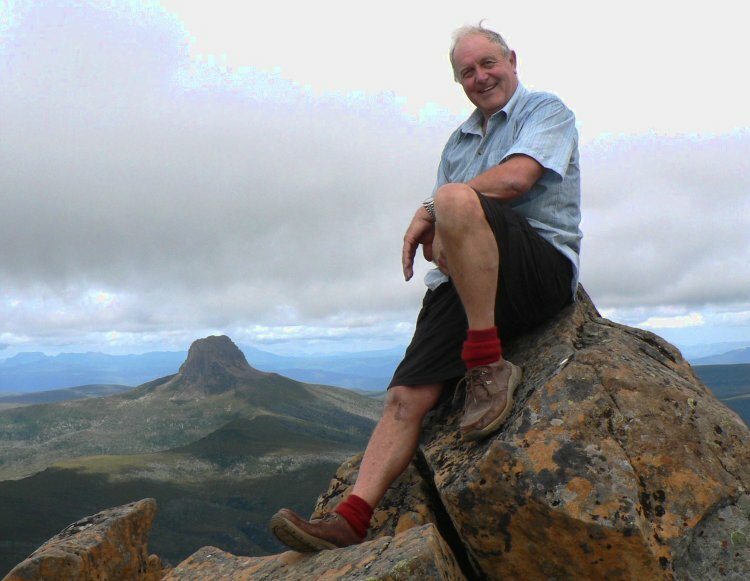 The next day Dave fancied going high, so set out for Marion's Viewpoint where still feeling in good shape, he went on to the summit. The problem with this assent is that it gets monotonically more difficult the further you progress and there are several pitches of technically demanding climbing. It was no surprise, if somewhat dispiriting, to find numerous people descending having turned back in those last 300m (we reckon less than 10% made it the day we were there). You can probably discern the look of pleasure and relief. Effort well spent on a veritable 'climber's mountain' with the compensation of outstanding views and unique rock formations. Tasmania was a wonderful experience, enjoyed all the more for the good weather and many friends we encountered there. We only had one day of rain when normally people talk of extremely variable conditions even encompassing summer sleet and snow. Back on the Oz mainland again we headed north, calling in on old friends and newer ones from our time cruising the Islands. We returned to see Dot and Ted in Sydney, feeling totally at home in the house they had lent us for nearly a month last year. Whilst there we realised that the following weekend was the 75th anniversary of the opening of the Harbour Bridge with big celebrations afoot. Our hosts extended their prodigious hospitality and we had a magic week together. On the Wednesday Ted and Dave even got to race in the harbour from Middle Harbour YC of which Ted is a member. It was a day of perfect conditions with what is one of the world's finest backcloths to sail with. Not only that but we won our division of the race! On Sunday 18th March Sydney was awash with celebrants, over 200,000 people walked the bridge, all road traffic having been suspended. 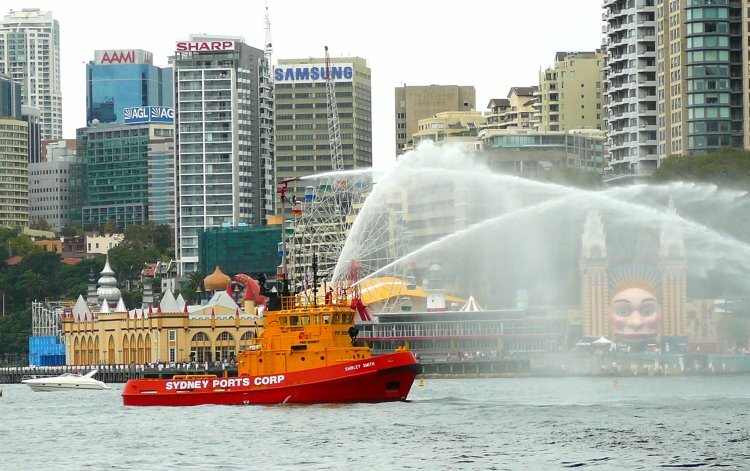 Starting at 9am there was 12 hours of continuous events from sail pasts to fly pasts, with street entertainers and bands. 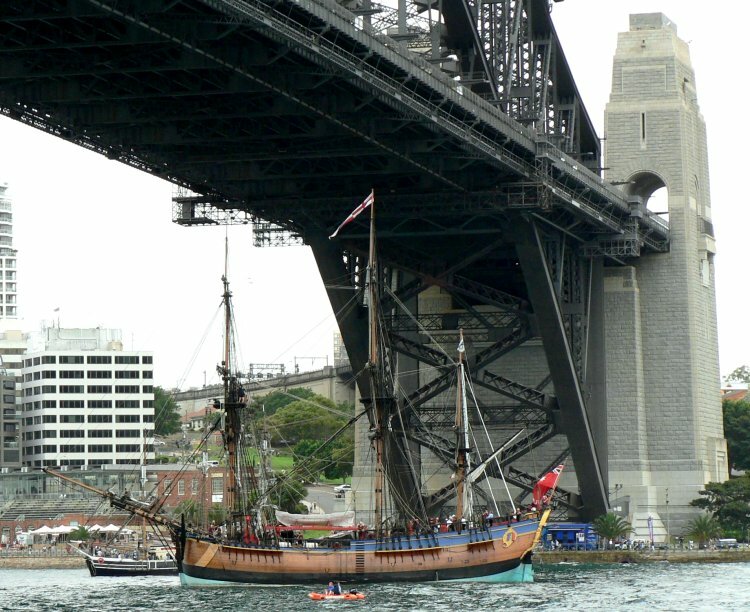 Below is the replica of Endeavour, Capt James Cook's vessel, one of many historic and vintage craft around that day. The fly past included a Catalina flying boat, Constellation airliner and Holden blimp sporting a moving message of congratulation to the city's major icon. Another of Sydney's icons is Lunar Park, an amusement park almost underneath the bridge's deck. Here it is, just discernible as a harbour tug leads a sail past of historic vessels. We have christened Australia 'the land of feral wildlife' as the species are mostly totally disparate from those found in other lands. So, as before, we finish this update with some examples of recent sightings. 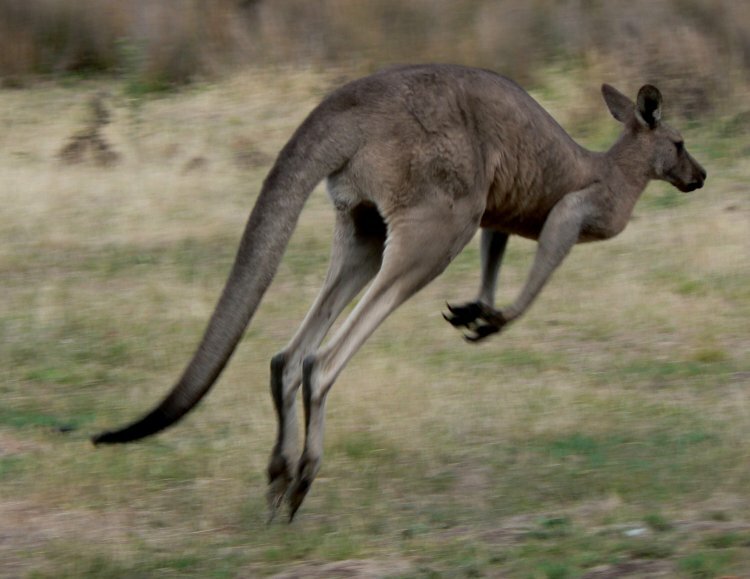 This kangaroo was just captured in full flight on my early morning foray with camera in Halls Gap in the Grampians. It looks just like a more detailed version of the one Qantas depict on their tailplanes. This time a variant of the above, a different kind of rootail. 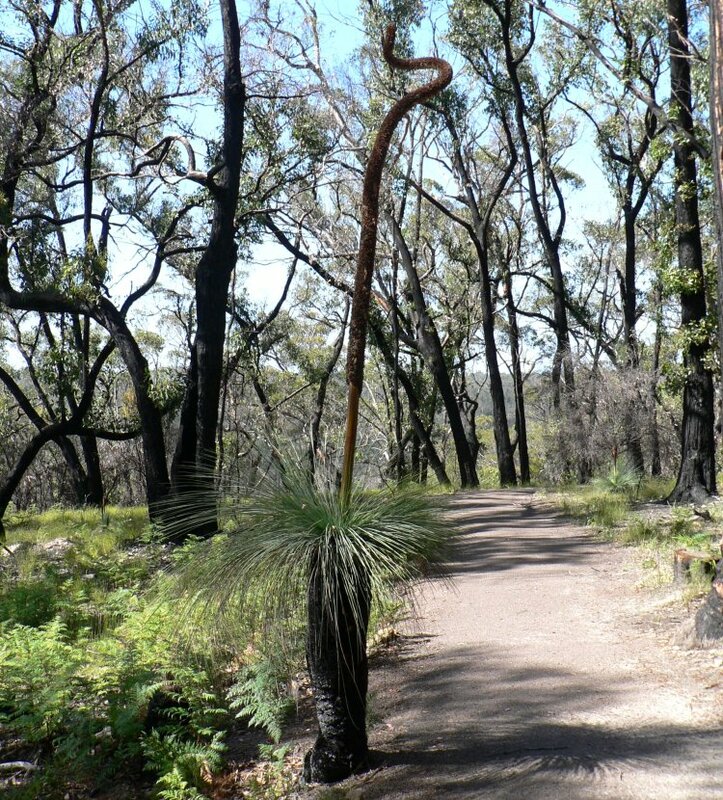 These strange plants we recognised for the first time in Tassie were named Kangaroo-tail or Grass-tree (Xanthorrhoea australis) after the tall flowering stalk that shoots up from the crown of the tree in response to disturbance, fire or drought. 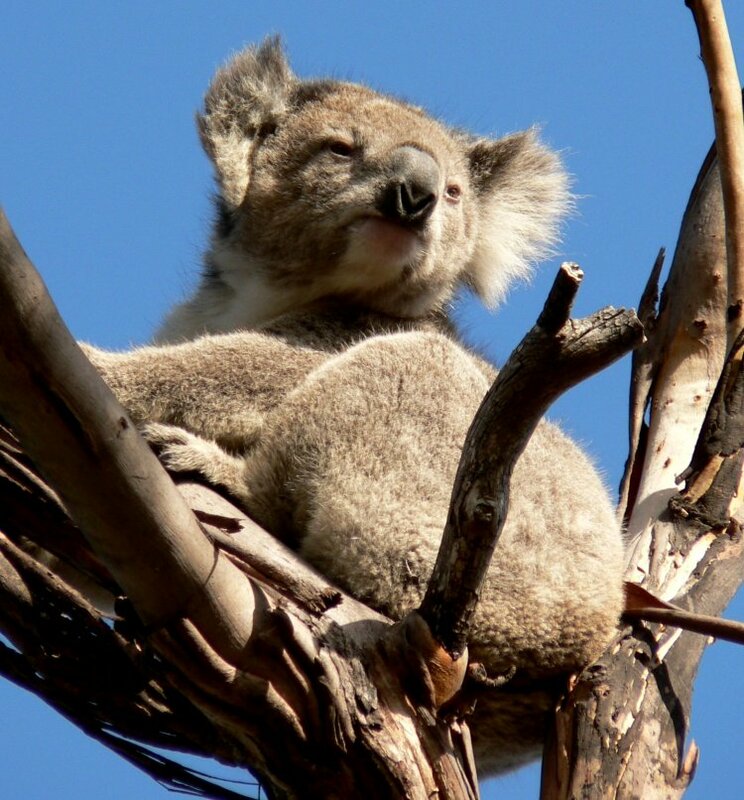 We have shown you koalas before but not from the wild. This was one of about five we saw in daylight on Raymond Island off the southeast coast of Victoria. Perched high in a gum tree it was well within reach with a 12x zoom lens. 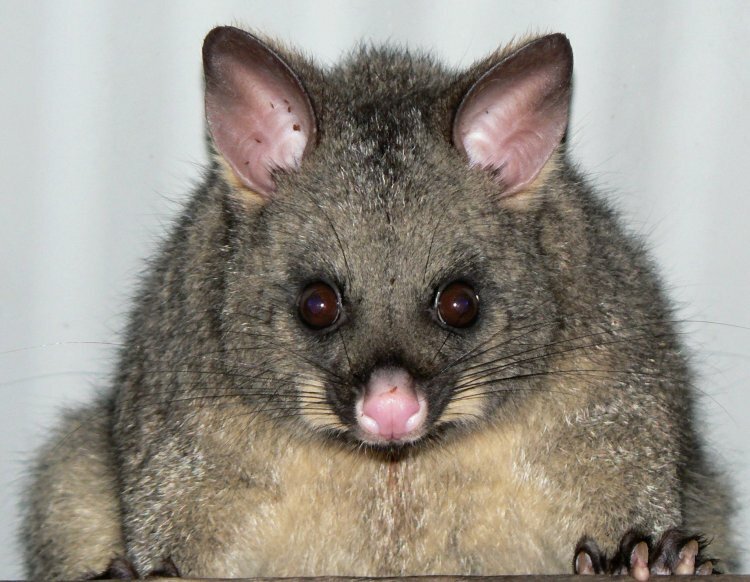 Possums are a scourge and pest in New Zealand where they have few natural enemies, so are trapped and poisoned regularly. Here in their Oz homeland they are tolerated and thus easier to observe around homes and campsites. This one appeared and lingered in the roof of a camp cooking shelter on Tasmania's east coast. 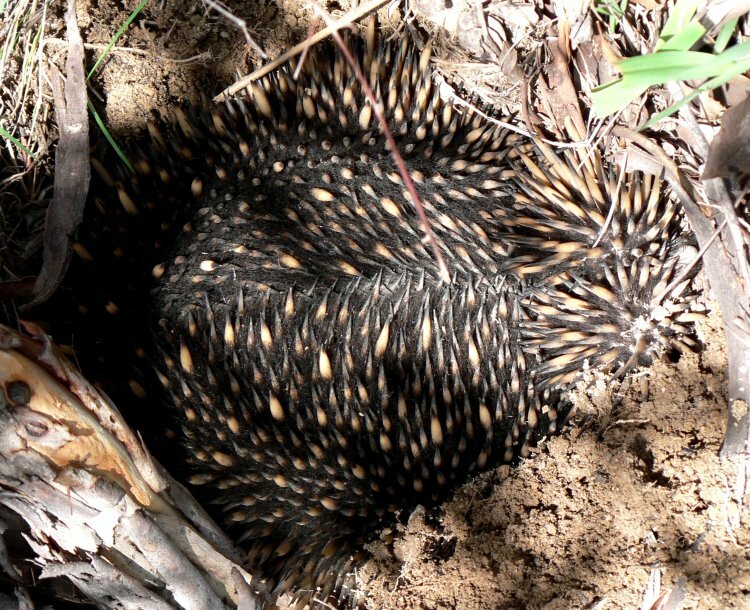 Echidnas are like large hedgehogs with long, thin, brown noses and much thicker and sharper spines. We have seen but two and on both occasions they successfully went to ground against a rock or in this case a tree. Not so much as to ground as into the ground. This one was digging down at quite a rate with what appear to be the two hind legs on the RHS. Finally, two fractious seals, part of a huge colony on the south coast of Bruny Island. Around 95% of them were soundly asleep in the most incredibly laid back poses but as it is said, it only takes two to tango! This looks like being a year of many nautical miles under the keel. After over five years in the South Pacific we have decided to head north to Darwin in April, planning to leave for Indonesia in mid-July. After around three months there we head for Singapore and Malaysia before fetching up in Thailand, probably in Phuket for this coming Christmas. We have entered the Darwin to Kupang Rally which will considerably simplify the tortuous process of acquiring all the documentation we need to transit Indonesia. Many of our friends have also applied so it should be a fun event. There is an addition security advantage in that we will be supported by the Indonesian Military Forces through some difficult areas. Sadly, we are now having to consider threats from pirates and religious extremists in addition to the ever present risk from opportunist robbers in the impoverished nations we visit. If you are interested in finding out more about the rally, who is on it and how it progresses, check out the website (www.sailindonesia.net). This move is largely prompted by a feeling that we would like to be nearer to our family as grandchildren and their great-grandma Kitty, grow older and the elastic joining us gets drawn ever tighter. Our current thoughts are to spend several years in SE Asia. It is a great cruising ground, the Andaman Sea being scattered with small islands and good diving. There are also excellent connections by air, especially to Asia, so it will make a good base from which to tour China, Vietnam, the Himalayas, etc.